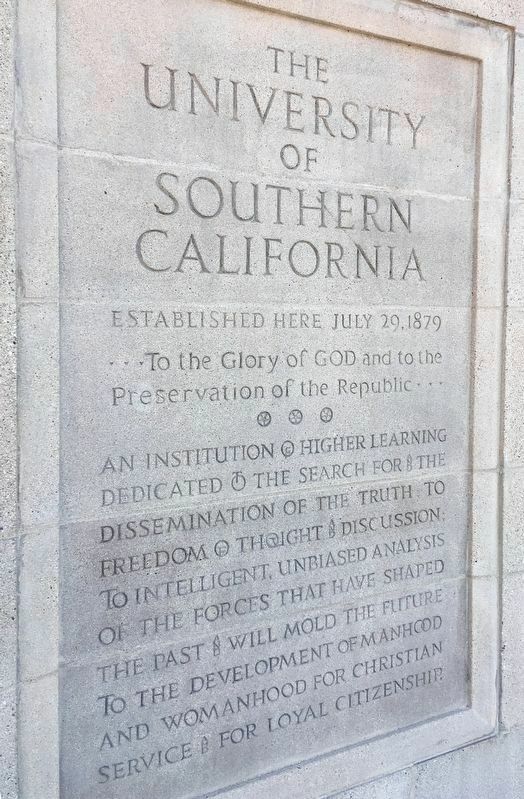 Established here July 29, 1879, to the Glory of GOD and to the Preservation of the Republic. An institution of higher learning dedicated to the search for and the dissemination of the truth to freedom of thought and discussion. To intelligent, unbiased analysis of the forces that have shaped the past and will mold the future. To the development of manhood and womanhood for Christian service and for loyal citizenship. Location. 34° 1.351′ N, 118° 17.033′ W. Marker is in Los Angeles, California, in Los Angeles County. Marker is at the intersection of Trousdale Parkway and West 34th Street, in the median on Trousdale Parkway. Touch for map. Marker is in this post office area: Los Angeles CA 90089, United States of America. Touch for directions. 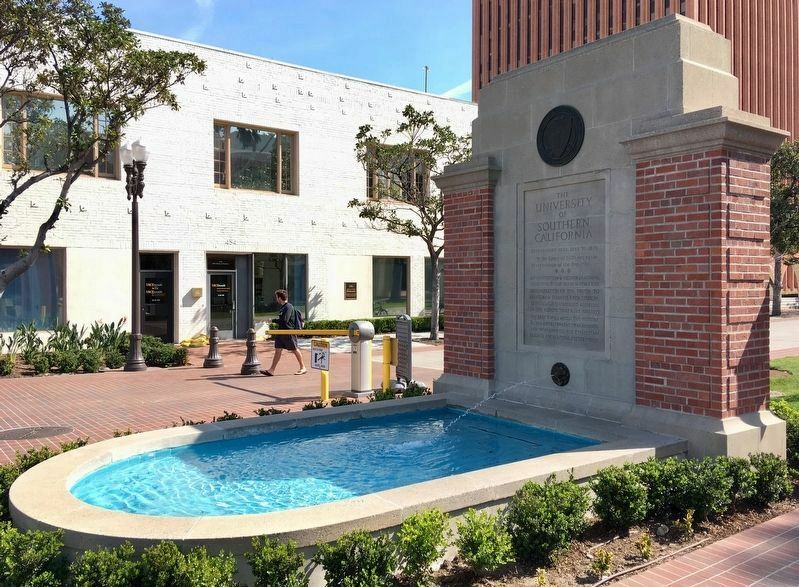 (about 400 feet away); The Founding of USC (about 500 feet away); Student Musical Traditions (about 500 feet away); Ceasar Estrada Chavez (about 500 feet away). Touch for a list and map of all markers in Los Angeles. More. 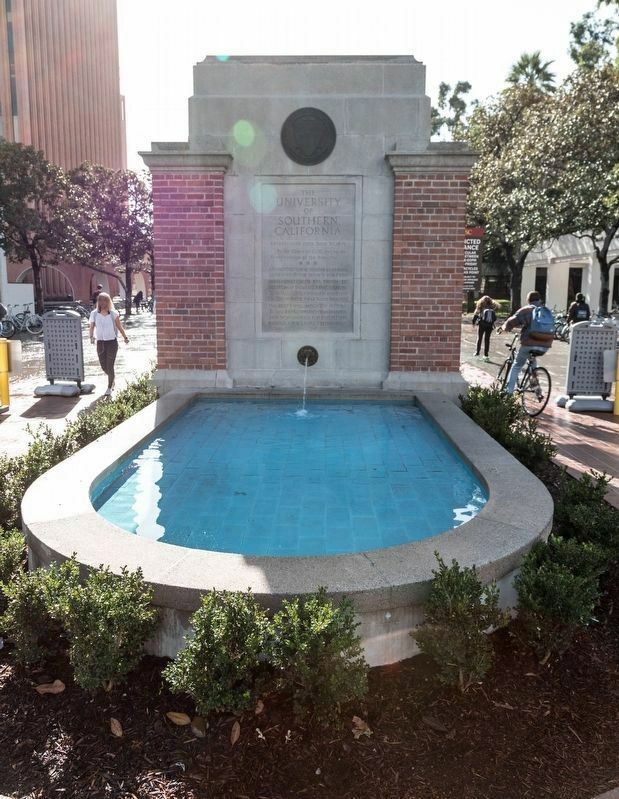 Search the internet for Founders’ Fountain. Credits. This page was last revised on April 2, 2019. This page originally submitted on February 22, 2019, by J. J. Prats of Powell, Ohio. This page has been viewed 53 times since then. Last updated on March 2, 2019, by Craig Baker of Sylmar, California. Photos: 1. submitted on March 22, 2019, by Craig Baker of Sylmar, California. 2. submitted on February 22, 2019, by J. J. Prats of Powell, Ohio. 3. submitted on March 22, 2019, by Craig Baker of Sylmar, California.